The prototype Dive Pretzel coaster, built in conjunction by Vekoma and Chance Morgan, proves the most visually intriguing of the rides proposed for the Orlando Thrill Park. Riders would climb to the top of a 148-foot-tall vertical lift before diving into a series of tight giant loops that make the 2,000-foot-long track look like a tangled ball of steel. Oh my that looks absolutely stunning, I sort of hope it will become a full production model, but I heaviy doubt it will because it is a colaberation of Vekoma and Chance Morgan, but who knows. I love the design name for it "Dive Pretzel Coaster". Oh wow! That looks interesting. I'd like to see what Vekoma will make with the Dive coaster design. Simba, Chance-Morgan and Vekoma have collaborated may times in the past before and Chance actually make spare parts for the American Vekomas. I am intrigued at how Vekoma will pull off a Dive Coaster, and I also never knew Chance Morgan have worked with Vekoma before. Chance have even fully built some rides for Vekoma. There was a recent deal between the 2 companies which meant 3 Vekoma family suspended rides in America were built by Chance. Chance is essentially the American branch of Vekoma now. This looks absolutely amazing, I so hope this rollercoaster lives up to it's design and that the park give it an original name. 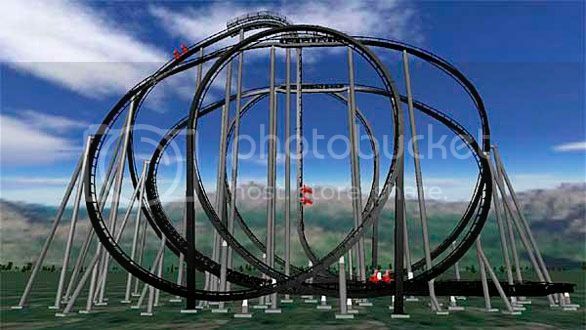 I don't think I personally can really judge this until it is actually in construction and I get to see a No limits recreation of it, and of course the actual onride pov. Same here, Dalek. It does look good and could be really fun but also very likely to be very rough. Ooh, this could be good. I can see this being amazing considering Vekoma have already built a more technical version of this in the Tilit coaster. As that was successful, I can see this simpler version going quite well. Plus it probably will be cheaper as well. Yeah I would imagine this would be cheaper than the Tilt Coaster, but I think that could also be because of how compact the layout will be.